I'm a big fan of indie games because, compared to big budget games by huge companies, they tend to be shorter, cheaper, and more unique. That's why I spent a decent amount of time at E3 trying out some of these lesser-known, but no less fun games. They also tended to have much shorter lines for the demos, so I was able to try more of them because of that. Not all of these are technically indie games, but they're the sort of games that feel like indie games or are at least developed by relatively small studios even though they may be published by larger companies. It's a fast paced strategic competitive arena shooter game... with a twist! Essentially, you're trying to shoot your opponent, but really what you're trying to do is flip the tile they're on with your shots. One team (or player) is black and the other is white, and each team can only move on one color. However, the path of each player's shot will flip the tiles to their own preferred color to create paths which act as walls for the opposition. You can't just spam shots forever or you'll run out and have to wait for them to recharge, so it's all about the strategy of creating paths while simultaneously trapping your opponents and avoiding being trapped yourself. Shots can also be charged to clear three tiles in a direction, but you need to plan this in advance since you can't change the direction of your charge once you begin charging. There are also powerup items which appear and can either be collected if you can get to them, or destroyed to prevent the other guy from getting them. It's all relatively simple in concept, but it's just complex enough to open up the potential for quite a lot of strategy and skill. Some of the levels make things more complicated as well by having certain edges wrap around to the other side. Inversus is an absolutely brilliant design idea for a multiplayer game and its strategic trap-your-opponent gameplay reminds me a lot of Bomberman's, which I also love. I definitely recommend this one for people who have friends to play with. If there is a goal to the game, it's to pursue thought bubbles that randomly appear over other things' heads and interact with them in order to display humorous messages, helpful notes, and unlockable cheat-code-like options. Another goal would be to fill up the library in the pause menu with all of the many different things in the universe, each separated alphabetically in categories. Objects you've played as can be transformed into instantly from this menu or you can choose to randomly transform into anything you've been. It's just a whole lot of silliness, but I found myself being entertained by it for a decent amount of time. No doubt Everything will be a Youtuber meme game, but at least it's a pretty good one with some effort put into it. Apparently Rain World has been in development for a quite a while and it's incredible that I hadn't heard of it before now. It's sort of a Metroidvania, but rather than ability upgrades, your exploration is limited only by your knowledge and skill with the game. If you know what you're doing, you can make your way anywhere from the beginning of the game. But you won't, because you're bad and the game is hard. It's set in a treacherous world of hungry predators and horrifically torrential downpours (seriously, the rain effect is amazing and scary; like visual static ripping apart the fabric of space). Your goal is survival and exploration. Dodge or pit violent creatures against each other to avoid being killed by them. Find shelter before the cycle of rain begins again. Eat enough food to not starve. All the while, climb and jump through tricky tunnels, platforms, and obstacles to explore a massive and visually appealing (if you like pixel art) world. According to the developer, the design goal was to avoid the situation in games where they get easier as you power up and become an unstoppable tool of destruction. In Rain World, you are forever vulnerable, and the environment and creatures can be assumed to only get more challenging. My only concern is that without new abilities, the gameplay may get stale after a while, as was the case in Knytt Underground. But all I could tell from the demo was that Rain World was great and worth keeping an eye on for fans of platforming and exploration. Fans of the Shantae games will know what to expect with this sequel / re-imagining of the series' origin story. It's challenging hair whipping, magic using, animal transforming, platforming action, but there are some differences from the norm. You may have noticed that the Shantae games are gradually having less back tracking and Metroidvania elements and are turning more into a sequence of levels. Half-Genie Hero makes no attempt to hide this and actually is a series of generally linear levels, although it will be possible to go back with new abilities to find secrets and upgrades. In the demo, Shantae was able to quickly transform into a monkey or spider in order to climb walls and jump high, or shoot web up to platforms above. These transformations also had hidden ability upgrades, like one that let the monkey launch off of walls or one that gave the spider form a poison shot attack. In the final version of the game, all these upgrades probably wouldn't be in the same level, but it was cool that there were still difficult to access hidden areas with rewards in them, even though the game is more linear now overall. Also, the graphic style is now a combination of really nice 2D sprite work and backgrounds and environments that look 2D in screenshots but are actually revealed to be 3D objects as the camera pans across the level with the player. It looks very nice and, as usual, the music and gameplay are great as well. I've had my eye on this one pretty much since it was announced. It's been described as being like an underwater version of Journey, but it was always unclear to me whether it was like Journey in that it was merely a pretty game, or if the similarity extended to its gameplay as well. Now that I've finally been able to play it, I realized that Abzu really is very much like Journey in almost every way. It doesn't seem to have much for puzzles or platforming, so it's even easier and more relaxing, but you basically explore your way down a path to progress through a series of beautiful environments. You can even "chirp" like in Journey. I actually played the demo twice, and the first time I thought that I was still primarily exploring and simply stumbling upon the "correct" way, but on my second playthrough I realized that there really wasn't much more than one way to go, apart from a few hidden objects. Not that this is bad necessarily, since it does feel like each new beautiful area is your own discovery rather than something the game has forced you into. This game won't be for everyone, but if you appreciate playing through beautiful art with a soundtrack of beautiful music (even the composer is the same as Journey's - Austin Wintory), you'll want to give Abzu a try. It's a relaxing and pleasant treat. Who would have thought that Touhou would end up with a fan game on PS4 at E3! To be honest, it's pretty much just a standard hack-n-slash dungeon crawler with Touhou characters in it. You've got leveling, abilities, and equipment, and you make your way through a maze of corridors and simple top-down 3D platforming to progress to a boss at the end of the area. Apart from the characters, Scarlet Curiosity retains the series' iconic "bullet hell" attack patterns in some of your own and your enemies' bullet spray attacks. Especially thanks to the boss's arena-covering pattern of bullets, it did end up feeling like a bit like a regular Touhou game, or like The Binding of Isaac. Overall, Scarlet Curiosity didn't feel all that special overall, but it wasn't bad either. If I know fans of the series, they'll take anything that has the cute Touhou girls in it anyway, so it should be good enough to be worth playing for those fans at least. I had never played the original Wild Guns on SNES, but I knew about it. It's a challenging Wild West game of shooting tons of bad guys in the background while avoiding their attacks with your character in the foreground. Reloaded is a remake of the original, with beefed up graphics, more content, and four-player multiplayer support. It's chaotic, challenging, and fun, though I think it'd be more fun with a light gun of some kind rather than a joystick for aiming. Unless you're experienced with the original, you and your friends will certainly lose until you practice and improve your skills - just like the old days. Another blast from the past - it's a new River City Ransom game! It heavily resembles the original in style, but now it has somewhat more 3D environments, real areas from Japan, and a helpful map on the 3DS's bottom screen. It's a pretty big world, so you can travel quickly with train stations as you find them around the map. I never played too much of the original since I was always getting lost and wasn't a huge fan of beat-em-ups, but the gist is that you explore the city, buy upgrades for yourself, and take down enemy gangs in each region. Tokyo Rumble still feels like the retro original, but has the presentation and conveniences of modern gaming. I'm no expert on this one, but it seems like something that fans of the original will enjoy. I am Setsuna has been out in Japan for several months now, so I'm sure everything is already revealed about it. It plays like a standard old-school Japanese RPG and has a battle system that's extremely similar to Chrono Trigger's (a meter fills up before you can act in turns, and attacks take enemy position into account so you may be able to hit multiple enemies in a line or circle, depending on the technique). What apparently makes this game more unique is its reportedly serious and sad story, accompanied by a matching melancholy piano score. It's the sort of game that's hard to get a feel for from a demo, but by all reports, it should scratch that itch that many gamers have for old school turn-based RPGs since every other developer seems to be switching to action-based combat. Somehow I forgot to add this to this article the first time through! After two seconds of research, I found that Kingdom is already out, but after a few more seconds, I found that the "New Lands" DLC is coming soon and may have been what I played at E3. Having not played the original, I didn't really know the difference, but apparently it adds more content. 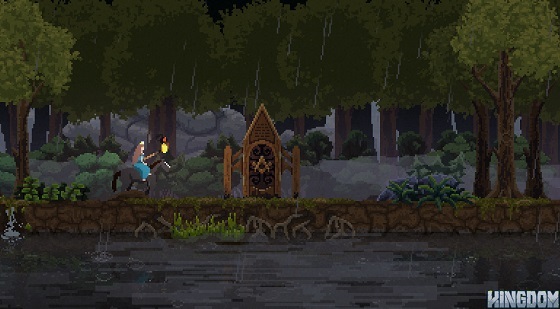 Anyway, Kingdom is a unique side-scrolling resource-management defense game. Basically, you walk back and forth collecting gold coins, and then choose how to spend those coins in order to best upgrade your kingdom and protect it from waves of monsters. You can pay peasants to work for you, upgrade your defenses, build things that will earn you more money, and more. Also, since you're on a horse, you have to manage taking time to feed the horse so it's able to run as well. I didn't play it for all that long since it didn't seem like the kind of game I'd personally enjoy, but it did seem like a good game nonetheless. I also watched, but didn't play Just Shapes and Beats and Zombies Shall Not Pass.